These 3 misspellings in 8 words at the Post Road location could be a world record. This entry was posted in Restaurants, Totally random and tagged Starbucks. Bookmark the permalink. My, is that an analogue chalk board?? No spell check app installed, thus the problems! The times they are a changin.. You no longer have to be a Ph.d candidate or a failed Jeopardy! contestant to work there. I bet Trump might even qualify. No. Trump doesn’t qualify for anything — at least that we can post here! Perhaps English is not their first language…and the people joking about this can now assign labels to themselves….you know, anti immigrant, xenophobe and so forth….and then they can bring up Trump’s name to mask their guilt while exposing their own hypocrisy. They should have bought the more expensive chalk with the built-in spell checker! But they got the free advertising they may have been seeking. And at least they didn’t spell it incontinence. You know how important those Starbucks restrooms are. Four misspellings if you include the headline of the story. “Starbucks” can be read either as a singular possessive with a missing apostrophe, or as a simple singular noun that happens to end in “s”. In either case “Starbucks’ “, in this context a possessive , is incorrect. I am terrible at spelling, and use a dictionary! Whenever I come across a poor speller like this person my first instinct, rather then assume they are ignorant and target their mistake for ridicule and laughter (which, unfortunately, appears to be the underlying point behind this specific blog Dan) is to give them the benefit of the doubt and politely (and privately) suggest that perhaps they might consider getting tested for the possibility of a learning disorder like dyslexia. It never ceases to amaze me the number of times I have encountered adults in our society who suffer from undiagnosed learning disabilities. Consider also that functional illiteracy impacts a sizable number of people in our society. (That is actually the reason why Fast Food restaurants like McDonalds prominently use pictures of the food on their menus. Customers can simply point to the pictures when they order.). Not to be a wet blanket but perhaps, Dan, you might consider in the future skipping joke posts like this one since we really have no idea if it was an honest mistake (ha ha) or an indicator of something more serious like a learning disability. I get it, John. But this is a business. If the manager is on the ball, he or she would 1) not assign someone with a learning disability to this task, and/or 2) look at the sign before it was posted publicly. This is not brain surgery — it’s corporate messaging and branding. I agree with you, Dan. This is a business. Supervision is necessary. As much as I typically agree with you Dan, I think this is nitpicking. IMO it adds a human touch to a company that thinks it can do no wrong. I tell you what – let’s call out every spelling error we see in Wspt over the next 90 days. I remember Marue English’s class at SHS ’69 listening to her opine that correctness in spelling was a restraint on student creativity. I wonder if there have ever been a spelling error on a parking ticket written by WPD. Now that would be appropriate for Colin Kaepernick’s involvement. But he’d have to join the police force 1st. Party on Garth!! Well said John F. Suggs, I can only imagine how this individual would feel if they knew they were being ridiculed after trying their best. I couldn’t agree more. As a mom of a special needs child with dyslexia, this is an insensitive jab. This post will remind me to reinforce an important lesson to my kids as they become more exposed to social media and the responsibilities and consequences that come along with it- think before you post. 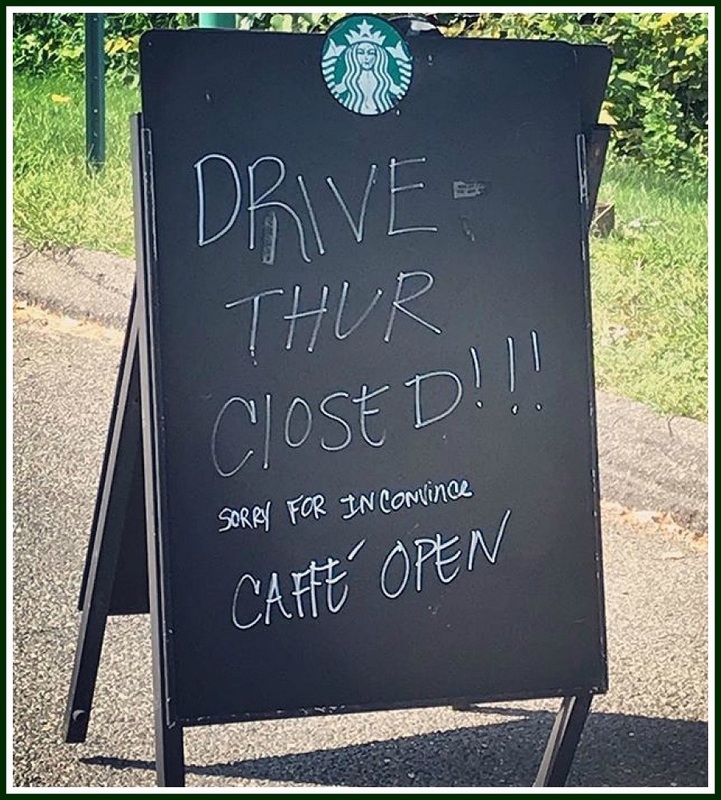 Time to shut down all locations for a 1/2 day of spelling sensitivity training. Just a tad dyslexic…many a great person had this condition and actually I find it quite charming…. I think it is a joke. My niece in California (Phoebe) says when she orders her coffee the employees at Starbucks have a competition to spell people’s name on their cup as wrong as they can (Feebee). Maybe the sign is the same thing, just a joke. Must be a Yale English Major! I was appalled and deeply saddened at the posting of this sign. I sincerely hope nobody brought it to his or her attention. Are you saying that the manager of Starbucks should not discuss the mistakes displayed on a sign that was intended to be viewed by the public? If this were your business, wouldn’t you want to point out the employee’s mistakes, and provide solutions to ensure that the mistakes are not repeated? It would be in the company’s best interest and the employee’s best interest to do so, in my view. I love Westport’s bipolarity. Better to be spelling correct than politically correct. Evidently that’s the new cause celebre.